This beautiful family home is a lovely property, built and furnished to very high standards in 2002. 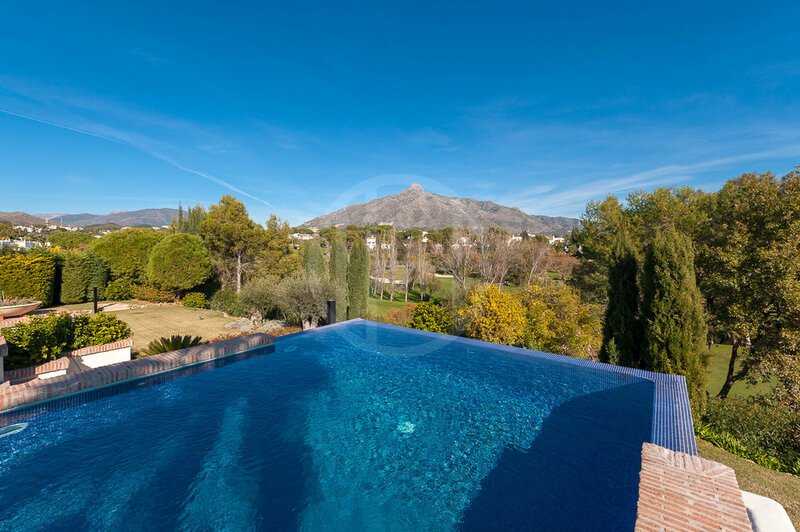 It has stunning views of the “La Concha” mountain and the Aloha golf course. The entrance level consists of an impressive double height ceiling entrance hall with wardrobe and guest toilet, the hallway directly gives view to the green golf views, the lovely custom made kitchen with top end Miele appliances and practical laundry room with own access door, the dining room and sitting room with a fireplace, all have direct access to the terrace through big sliding doors that opens to the lovely pool area with an infinity edge to the golf course. The rest of the ground floor comprises 2 spacious bedrooms, each with fitted wardrobes and bathrooms en-suite with a further guest suite located next to the pool and tennis area. On the first floor you will find the master suite consisting of a large bedroom and bathroom with jacuzzi and shower, a study and his/hers dressing room and storage areas. Lovely use of wooden flooring and very private terraces. On the garden level you will find a superb gym with sauna and bathroom. A guest apartment with kitchen and 2 bedrooms sharing 1 bathroom. A separate guest or staff quarter, bodega and garage for 2 cars, technical areas and storage completes this level. 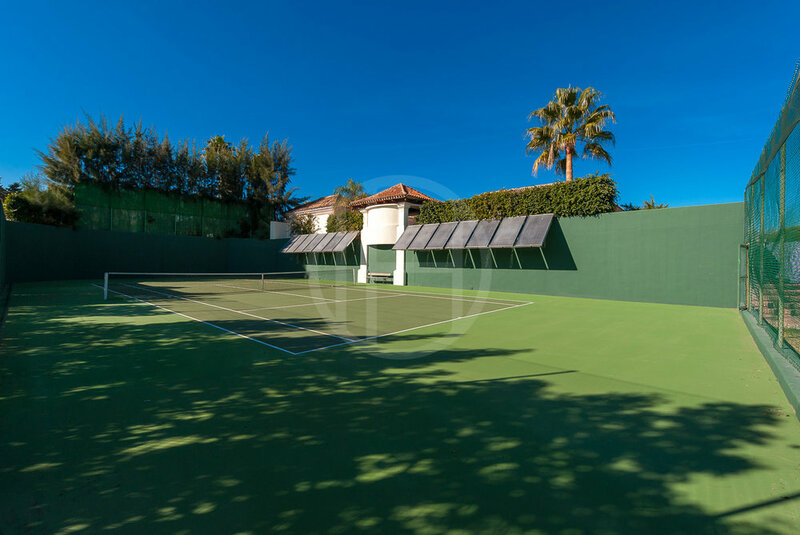 The property has an excellent tennis court, a putting green and a stunning garden with large private areas. 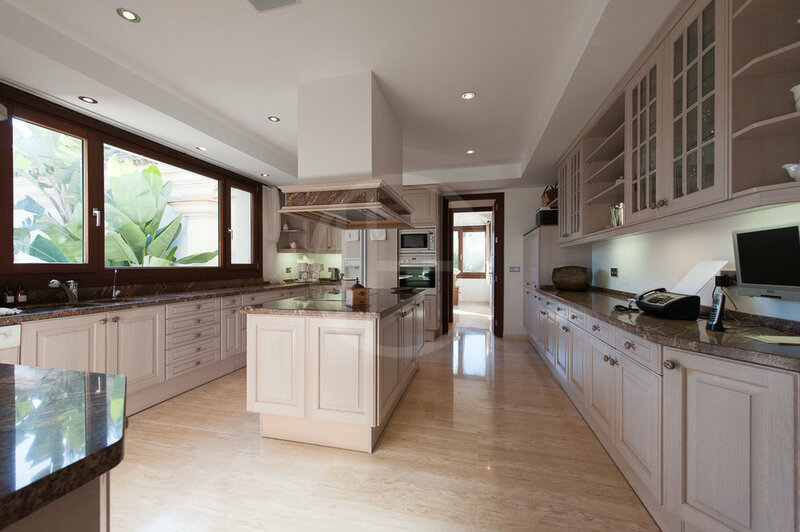 The property presents itself in a well kept condition, however we see it more as a reform project with great potential.